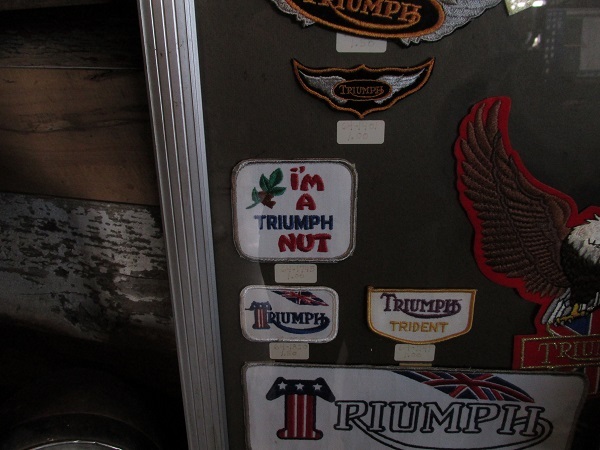 A frame display of leather jacket patches seen by our correspondent Dean Rennie on his trip to Iowa. Each to display the wearers allegiance to the British marque. The oak leaf is perfect: an English Oak Quercus robur. And so goes the salutation of the great Spock. Today saw the passing of Leonard Nimoy at the age of 83. Photo is his Mission Impossible character Paris looking logically cool. Watching an old TV show from the early eighties. Starring Tom Selleck as the titular private investigator turned Hawaiian gallavanter for thriller writer Robin Masters (voiced by Orson Welles). 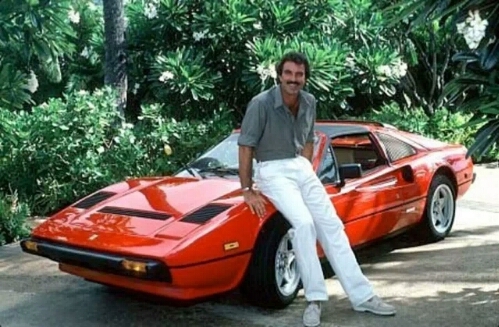 He gets to blast around in his employers Ferrari 308 GTS. It is the classic mid engined sports car in red. von Dutch style! My intrepid roving reporter Dean Rennie was in LeClaire IA at the American Pickers store. 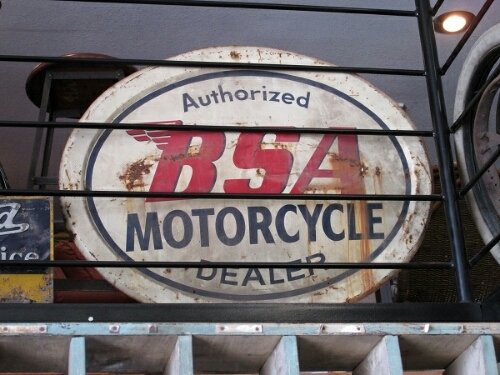 Owner Mike Wolfe and TV partner Frank Fritz were on the hunt for a rare motorcycle. 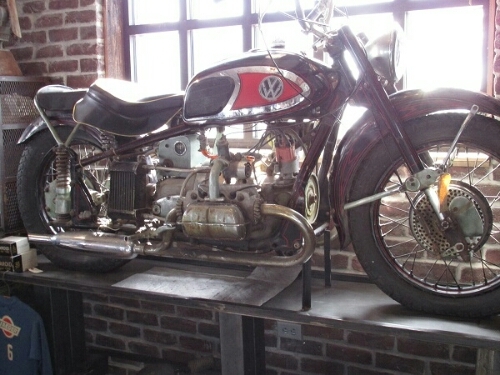 A cruiser framed item with a Volkswagen flat four engine shoehorned in. They discovered it under a dusty tarp in a barn. The VW badge remarking its provenance. Here a photo of the bike displayed at their location just north of the Quad Cities. “Rouler à moto, c’est comme écouter de la musique en stéréo, vous faites vraiment partie de l’environnement”. That’s the words of fast femme Marianne Weber, Belgian reporter speedster who was as comfortable going rapide on a motorcycle as most of us are in a lounge chair. 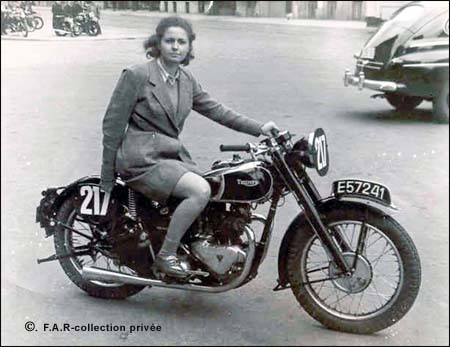 Her racing steed from 1947 a Triumph 3T 350cc. 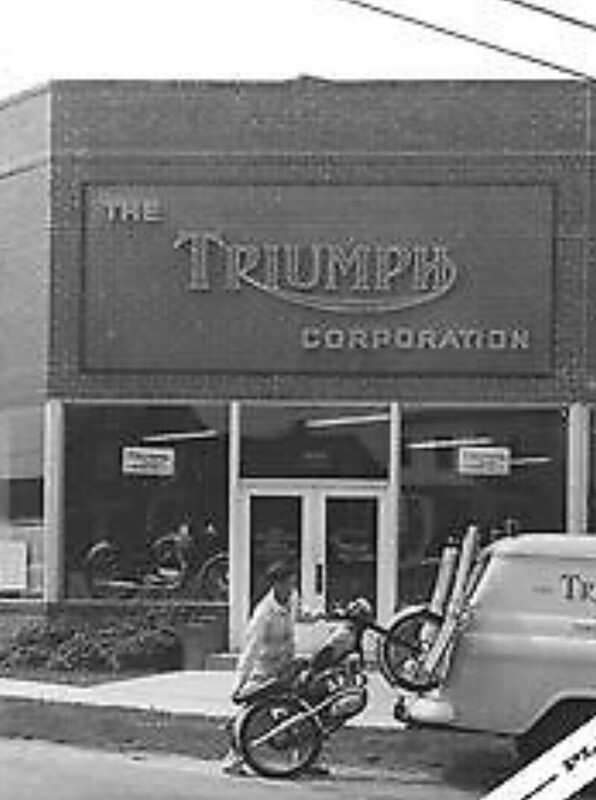 One of Triumphs first post war racers. 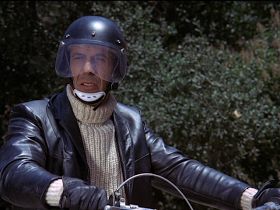 “Riding a bike, it’s like listening to music in stereo, you are really part of the environment”. Good words. 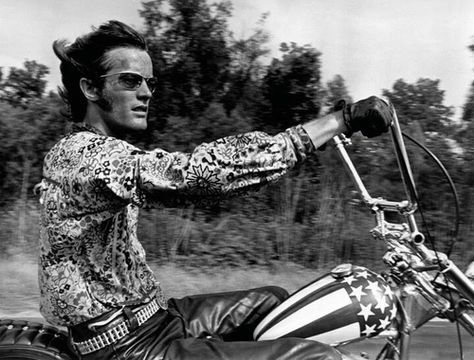 Happy Birthday to Peter Fonda – 75 today. 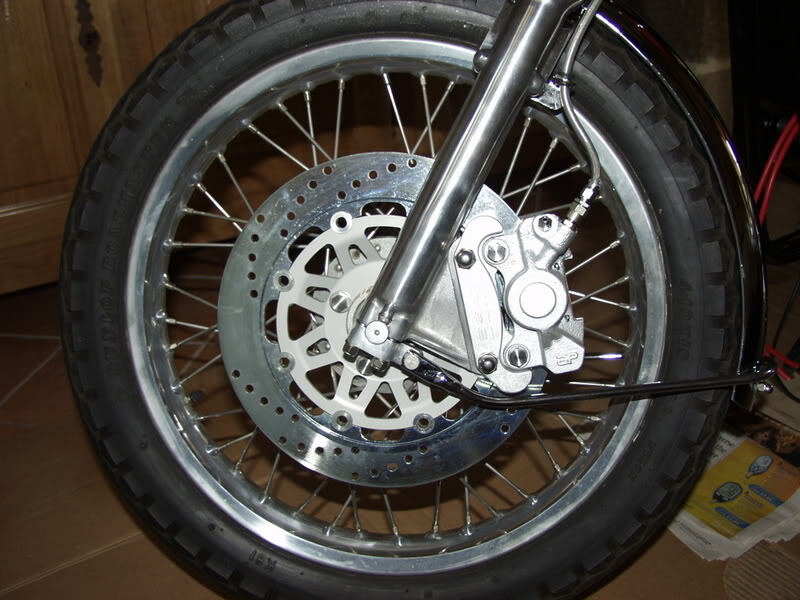 There is a fairly straightforward brake upgrade for the seventies disc stoppers that my Bonnie has. A 12″ floating disc with cooling holes and a mount adapter for tge extra inch of lever provided. With stainless steel clad lines and a freshened up master cylinder this will certainly give superior anchoring. 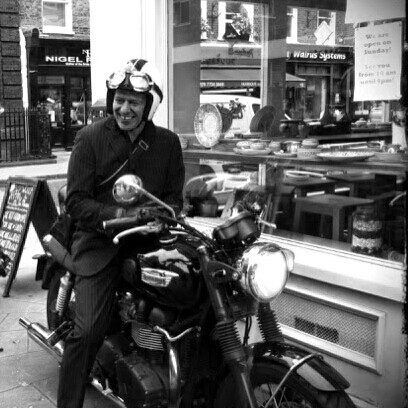 He’ll rough it, take the back roads, eat whatever is available; but now he’s a frontman for the big bad Triumph Tiger. Bear Grylls is man versus wild and mountain, sea, desert, forest traveler extraordinaire. Good bike to choose for his lifestyle. 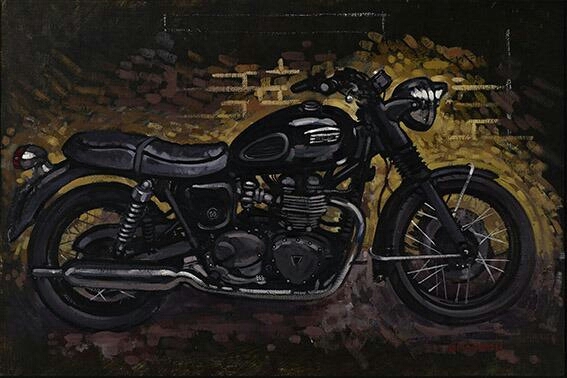 A Paul Simonon painting of a dour T100 Triumph Bonneville. Stealthy, gothic, oily. Looks like you could hop on her and hare off down to Boxhill. Looks like our Clash bass-man has this very machine. Old promotional photo of a new Cub being hauled up into a van off to its owner. Nice big shop sign, pre-unit machine in the window, I can smell the scent of oily machines fresh off the boat from Meriden. It’s cold cold cold here in Chi-Town. Minus five Fahrenheit tonight. So a venture to the car show down at the vast McCormick Conference Center was in order. Plenty to gawp at. Lots to sit in. Others to shy away from. The all rounder that appealed to me was the 2015 Ford F150 truck. Its aluminum chassis drops a third of a ton of dead weight and the eco-boost 2.6 v6 is meant to be a decent powerplant. Plenty of leg and headroom inside with a spacious back seat crew cab. 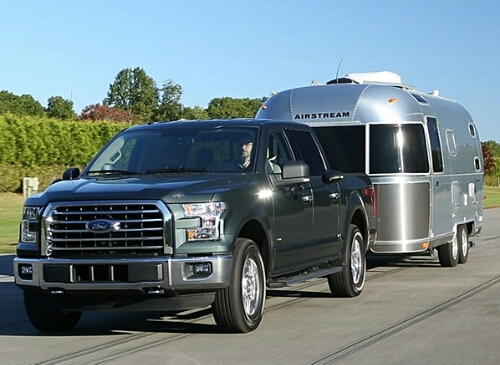 The Airstream will be towed ably to destinations galore! 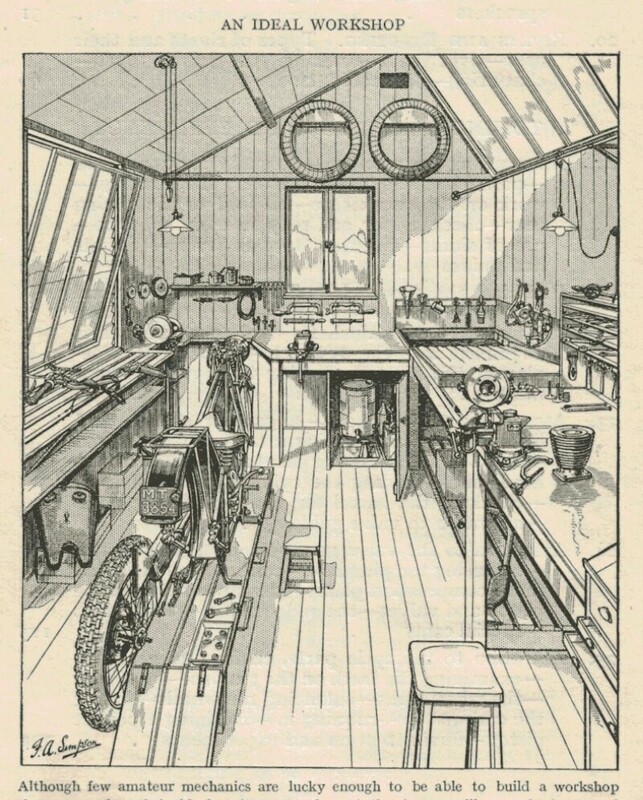 Model Kits. Growing up I couldn’t get enough of them! Aircraft, tanks, cars, ships. Assembly kits or scratch built. I’ll have a little dabble into this world of polystyrene glue and plastic. 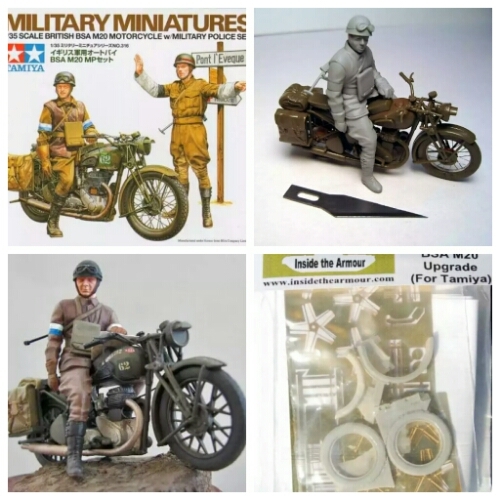 There’s a 1/35th BSA M20 with rider and arm waving military policeman that I’d like to acquire. Nowadays there are upgrade detail kits that are finely laser-cut sheets of metal that add fine sparkle. Spokes, buckles, foot pegs. Perhaps some sharp tweezers will help…. I’d better get an illuminated magnifying glass too! 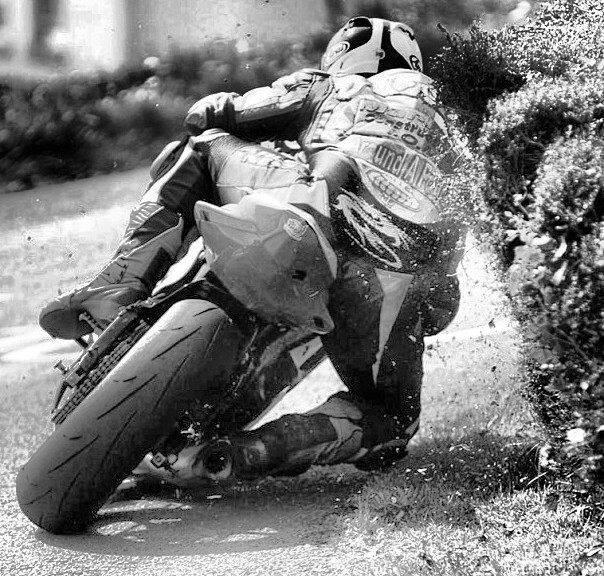 Gary Johnson cuts a close line around the man eating course of the TT. Aboard his 675R Dayton he took top place in 2014 supersport race. A motorbike riding couple zoom past clouds of helium filled heart-shaped balloons. 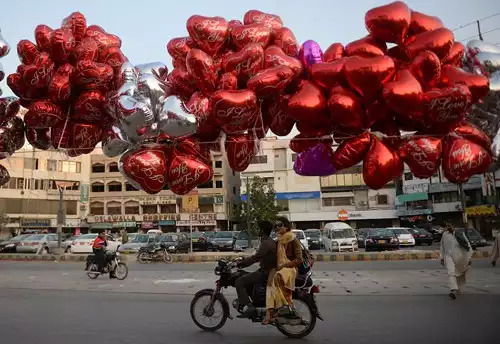 It’s a street scene in Karachi Pakistan and similar notions of love are displayed around The World.